If one of us strolled into Beaverton in 1912 and asked a local resident about the Farmers Market, this inquiry would quite possibly be met with a chuckle. Such a response would likely be followed with directions to a nearby farm, since Beaverton was a farming community that was home to what was declared to be the most valuable tract of farmland in Oregon. This fifteen-acre plot of farmland was known for growing plentiful onions in fertile beaver-dam land. Beaverton’s famous horseradish was grown nearby. Asparagus and garlic were other major crops. Local farms and gardens also grew just about every type of vegetable and fruit that could grow in this latitude. The finest apples, plums, and blackberries were plentiful. Locally grown hops were a core item sold at the wholesale market during 1910. Prohibition took hold about five years later, but this didn’t stop local farmers from growing and processing hops throughout the 1910’s. It makes perfect sense that at least some Beaverton residents were skilled home brewers–of real beer, not near-beer. One farmer wrote in the Beaverton Times about the “joy of having fresh eggs, golden butter, thick cream, succulent spare-ribs, roasted Belgian hare, and white potatoes,” and about choosing from pumpkin, strawberry, custard, and apple pies. In 1915, the Beaverton Times recommended that, during hot weather, Sunday breakfasts be different than usual weekday fare. One suggested menu consisted of raspberries or blackberries, fried eggplant, toast, and coffee. Another option included fruit, cereal, small broiled lamb chops, cold asparagus, rolls, and coffee. The Beaverton Restaurant, which was located in the historic Fisher Rossi building on Broadway, began serving customers in 1919. Its menu included veal cutlets, T-bone steaks, lamb chops, and ten different kinds of pies. Patrons could choose from apple, blackberry, raspberry, cherry, pumpkin, lemon, custard, coconut, and pineapple pies. 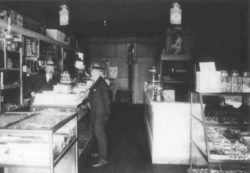 The Beaverton Confectionery, also located in the Fisher Rossi building, sold candies and soft drinks. It may be of interest that there was a Beaverton Bakery, although it was not related to the present-day establishment of the same name. According to an advertisement from 1919, the bakery sold confections and cigars, and served light lunches. Commercial creameries made butter near Beaverton, but in Beaverton one could actually buy Holstein dairy cows from Chas E. Barnard and make fresh butter each day. Considering that wheat was grown in or near Beaverton, the local and homemade baked goods must have been second to none! A household could easily use 60 pounds of sugar during canning season. Beet sugar was produced in other areas of Oregon. There was at least one apiary that sold honey that was fresh from the hive and gathered from Beaverton flowers. It should be no surprise that homemade pies would have been an everyday food, and likely preferred over store-made pies. Freshness and quality were undoubtedly held in high regard, and residents had the ability and resources to make the tastiest, freshest pies in the world. This includes savory horseradish and onion pies, likely made with eggs, cheese, milk, and butter!